That was the first post-season overtime goal of Smith's career, and the third winner of his career in the playoffs. That ties him for the most in Predators' history, and Smith said it probably was one of his biggest goals. "It was kind of a delayed reaction," Smith said. "I think (Stars defenceman Roman) Polak knocked it down and I just tried to get a stick on it and tried to feather it in there. I don't know how it got through but able to just get a stick on something and get some traffic and get it in there." "We knew we were going to get Nashville's best and we did," Dallas coach Jim Montgomery said. "And you know they were the better team tonight, and probably not for Bish [goalie Ben Bishop] we're not in overtime. So we got to come back and we will. We'll be better." Dallas took the lead at 1:59 of the second when Tyler Seguin got the puck off a turnover, passed to Benn at the side of the net for the captain's first goal this post-season. Stars centre Mattias Janmark went straight to the locker room after a collision with Predators' defenceman Dan Hamhuis into the boards. Janmark was down for a couple minutes before being helped off the ice at 3:10, putting no weight on his left leg. Janmark managed to return later in the game. Nashville tied it at 3:56, with Grimaldi scoring over Bishop's glove from right in front off a pass from Austin Watson. 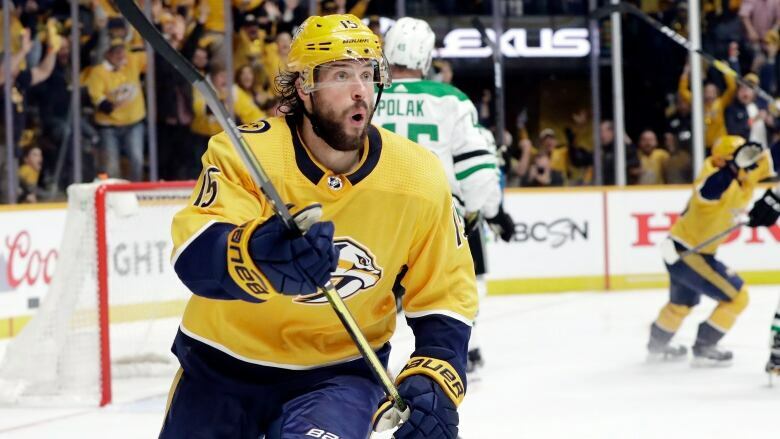 It was the first post-season goal in Grimaldi's third career playoff game and first with Nashville, and he got the call Saturday morning that he was in the lineup with forward Brian Boyle out sick. Radulov in the opening minutes. Stars centre Jason Dickinson hit the top right corner of the post 5:24 in.